"A Traditional Style for a New Time", that's what Sabre put on their brochures when they launched the Sabre 36 MkII. It has even more meaning today in a world dominated by flashy European designs. 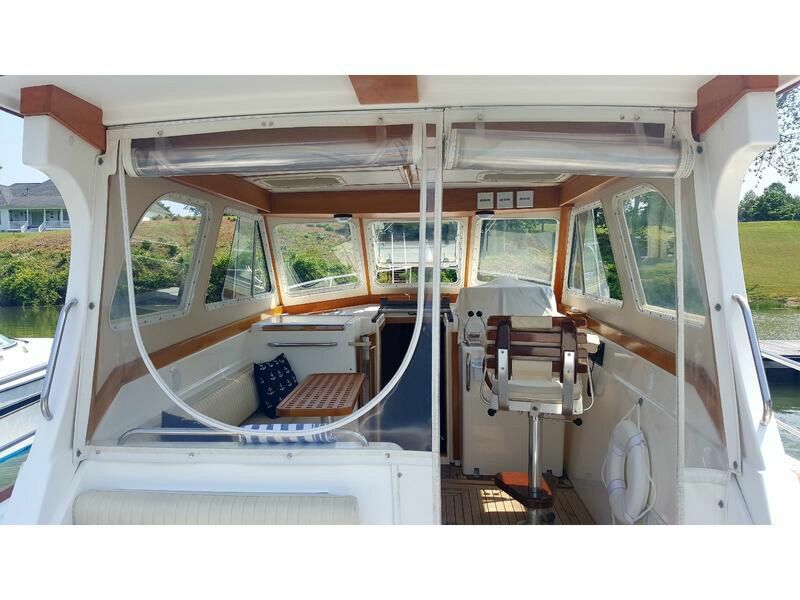 We are proud to offer Epiphany , this is a very special Sabre 36 MkII. She is equipped with the optional factory hardtop. This hardtop was additionally customized by Sabre at the factory to increase the headroom in the cockpit. This is the only Sabre 36 MkII to have this customization. 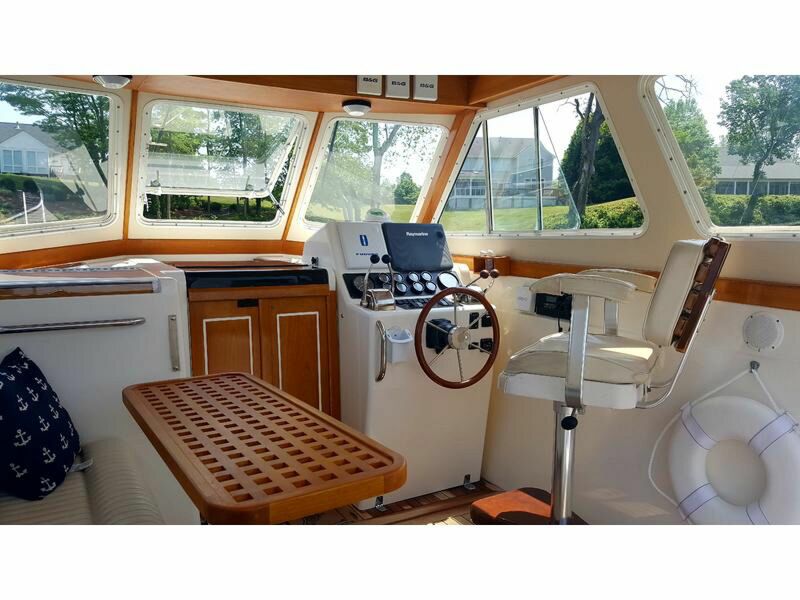 With the increased headroom the cockpit feels more open and airy, allowing for many hours of use or entertaining in any condition. There are two hatches on the overhead, opening center window, and sliding side windows as well to allow for full ventilation. Additionally a second air conditioner was installed to provide comfort in the cockpit. 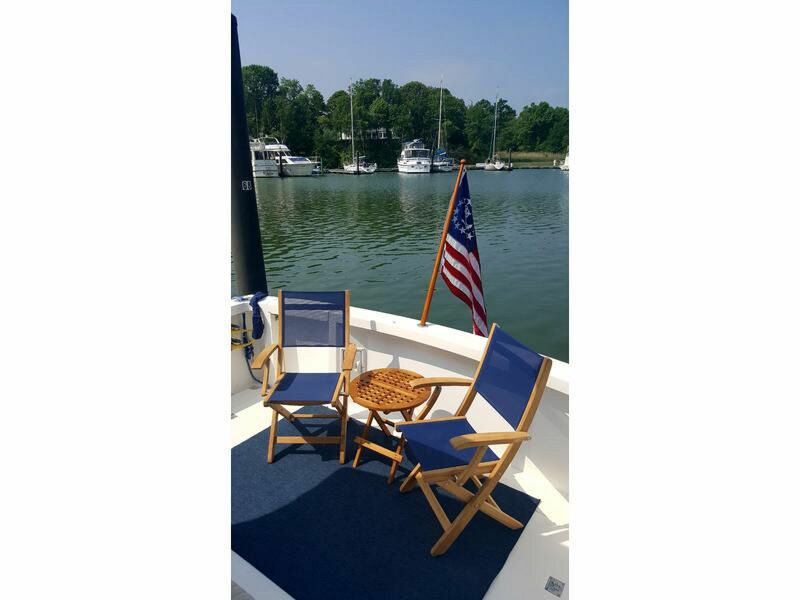 This add on is a must have during the summer months on the Chesapeake, as well it will extend your boating season to an almost year round activity with its reverse cycle heating. 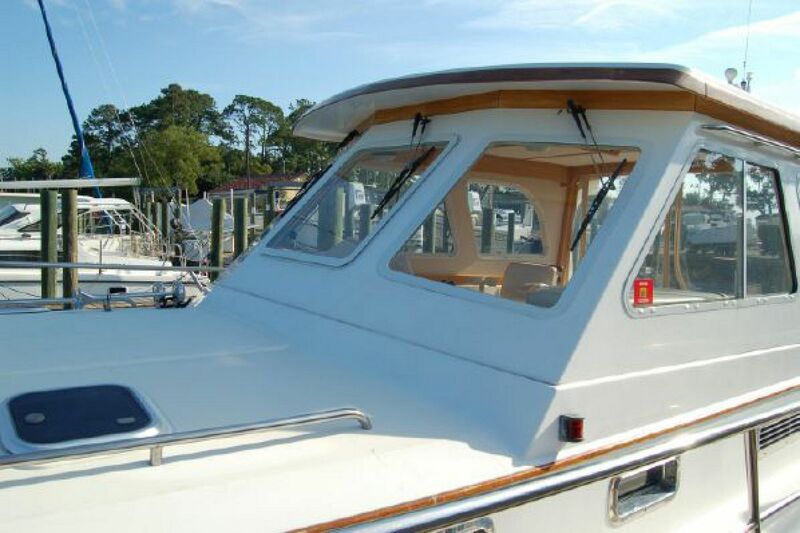 The hardtop is also equipped with stainless steel grab rails to allow for easy movement to the bow area. 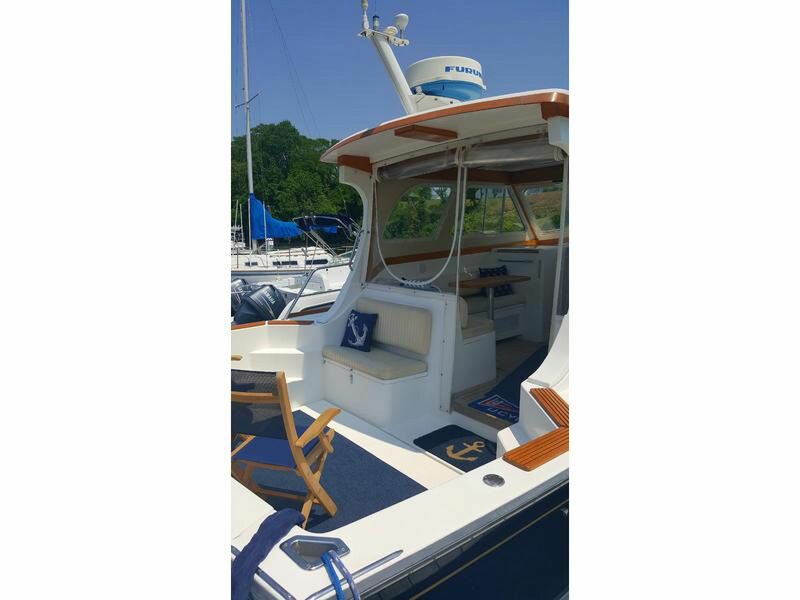 The Sabre 36 has wide side decks and high stainless steel railings to aide in forward movement as well. 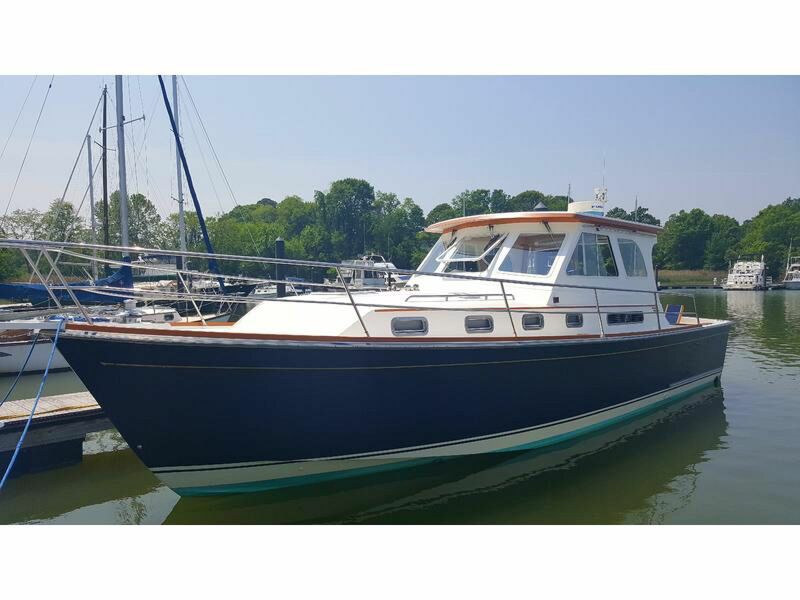 Her current, and third owners, bought Epiphany in 2016 and have thoughtfully brought her up to Bristol condition. Her wood work is as immaculate as her service history. For the past three seasons she has been maintained by the same mechanic, who also accompanied the boat on her delivery cruise from Florida to Virginia. This Sabre also has the preferred CAT 3116 diesel engines. These engines are bullet proof and will perform for years to come. All CAT recommended services are up to date and then some. 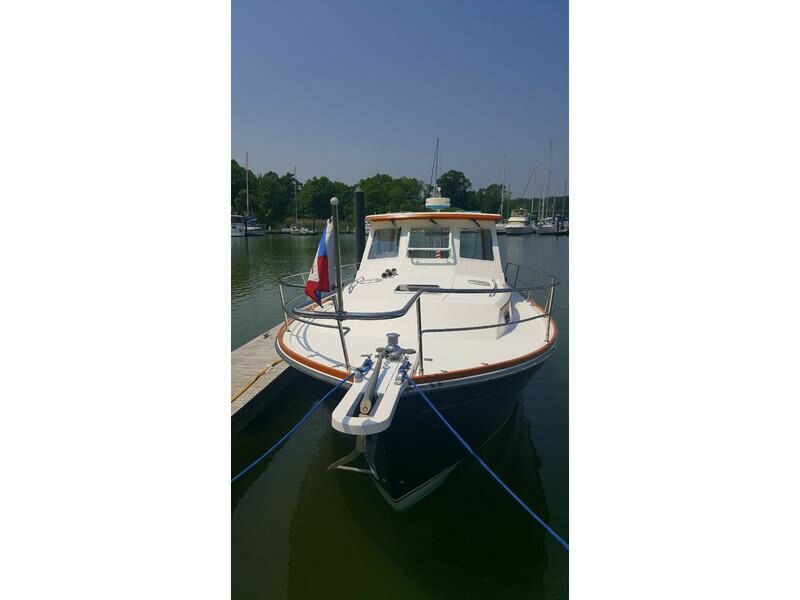 With her power and deep-vee 24 degree dead rise keel she has the ability to cruise in all conditions. 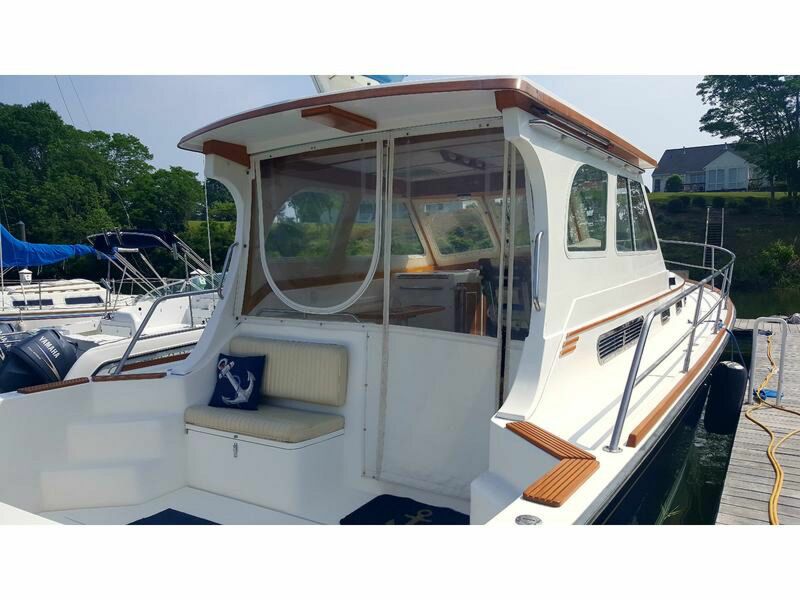 Coupled with built in hull strakes that knock down spray and wide chines that provide excellent stability she is at home on the water and dockside. The current owners are regular participants of their local yacht club cruises and constantly get accolades everywhere they go about the boat. Her flag blue with white boot stripe Awlgrip paint gleams and the gold leaf inlaid name and hailing port finish her off. 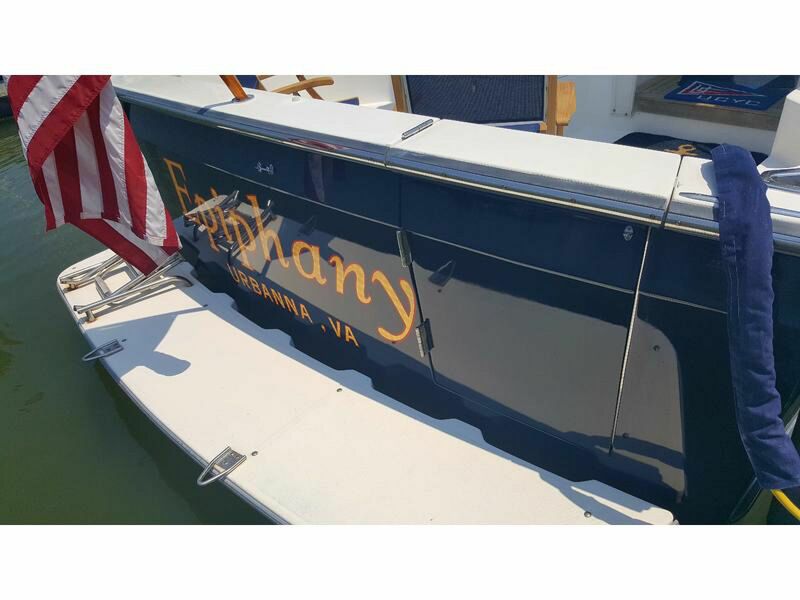 If you are in the market for a Sabre then Epiphany must be on your list! Contact the listing broker for more details and to schedule your visit. Epiphany is currently on the hard and winterized, but shall be commissioned by late April. 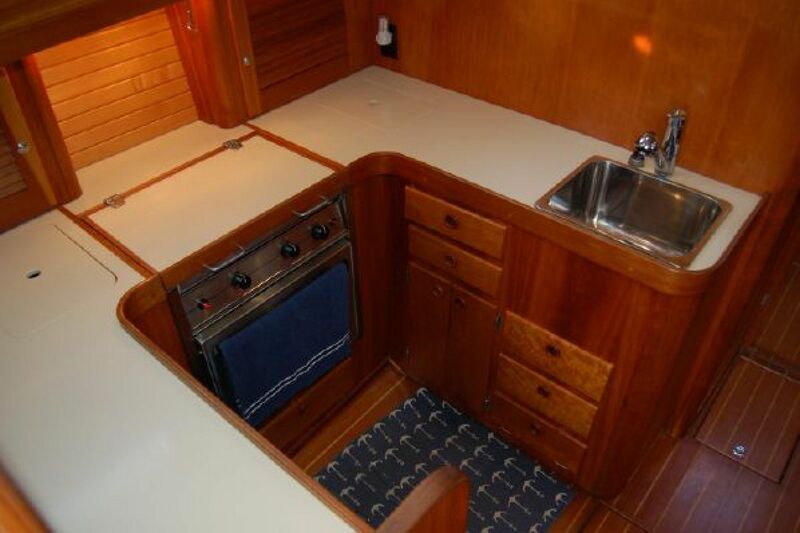 Commissioning shall include bottom paint, hull topsides detailed, and spring engine service. 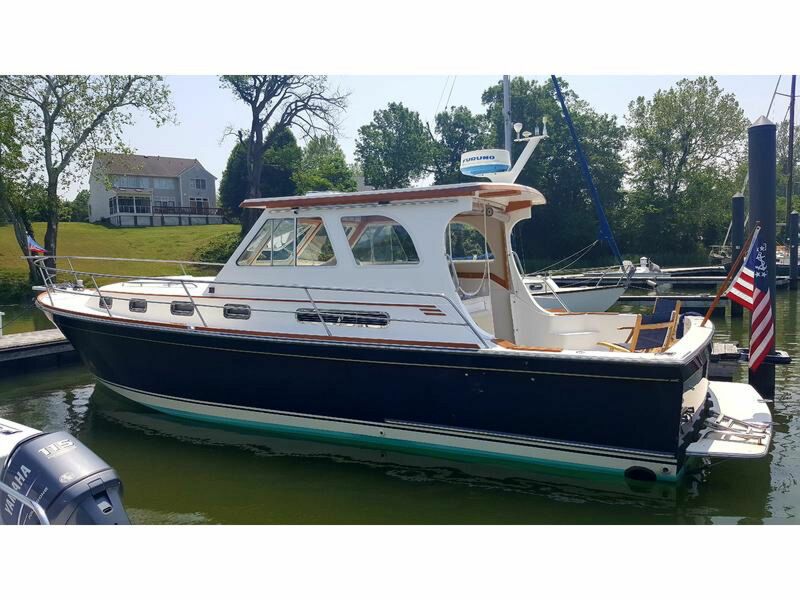 Her owners are looking to upgrade to a larger Sabre and she is seriously for sale. More photos and specifics forthcoming. 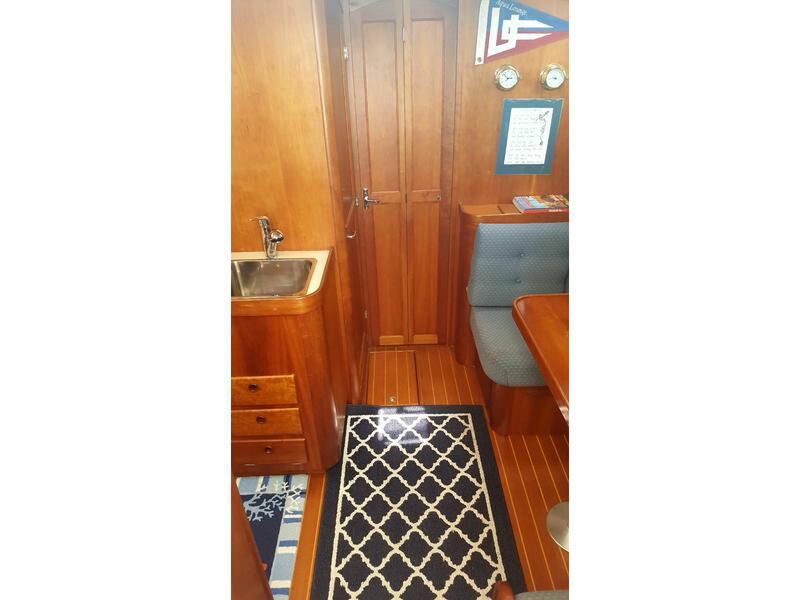 Teak and holly sole throughout with American Cherry hand rubbed varnished paneling and trim. Excellent fit and finish by the craftsmen at Sabre. Five opening port lights and deck hatch for ventilation. Air conditioning with reverse cycle heat. Two units, one for below and the other for the helm area. Settee drops down to form a berth for guests. 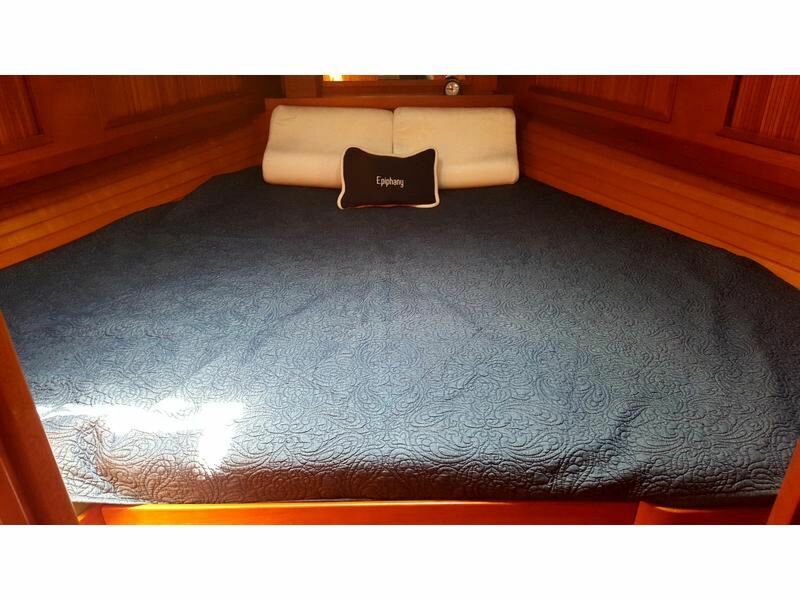 V-Berth layout with filler cushion. Generous storage in many lockers and drawers. Propane stove and oven with hinged covering board. Two opening port lights and large deck hatch for ventilation. Access from the salon or stateroom forward. Vacuflush head with flip down sitting area. Corian countertop with pullout washer. Opening port light and deck hatch for ventilation. 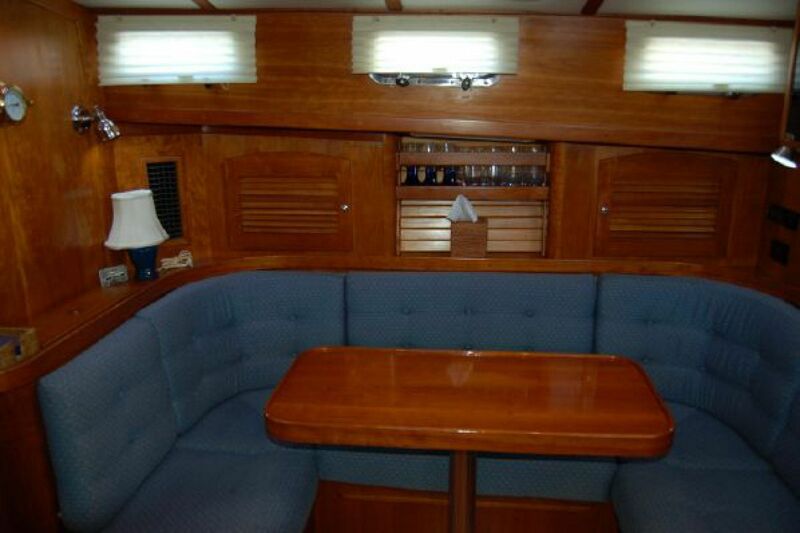 The cockpit is an open area fit for entertaining guests and the whole family. On the forward section there is a bench with storage beneath. 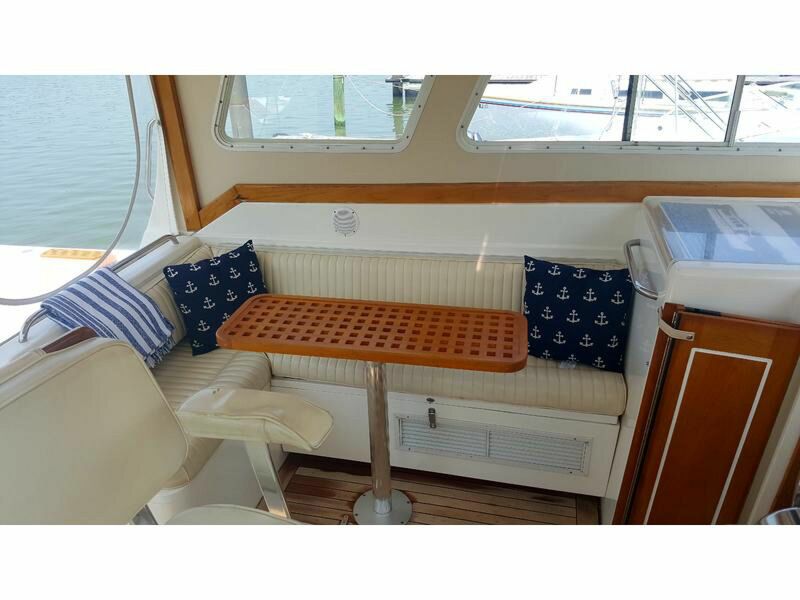 There are two folding teak chairs and table included, plus a removable all weather carpet. Under deck access to storage and equipment is provided by three large opening hatches. 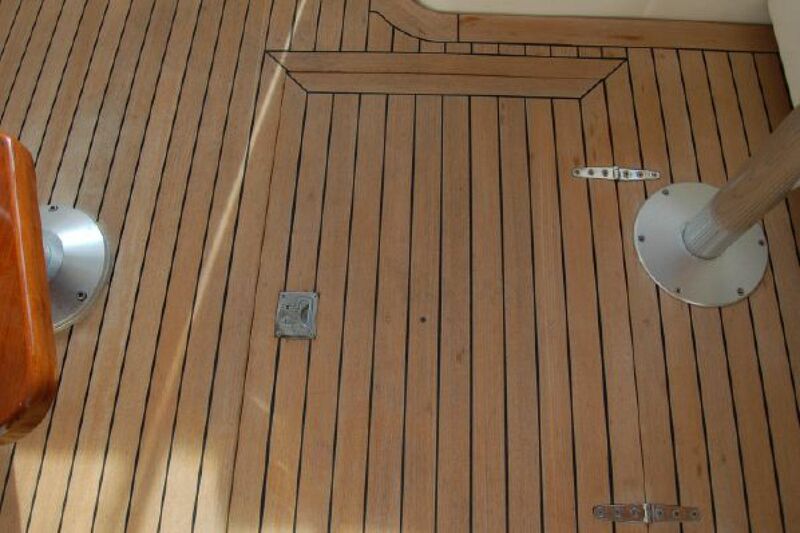 There is also an opening transom door which leads to the fiberglass swim platform with folding stainless ladder. 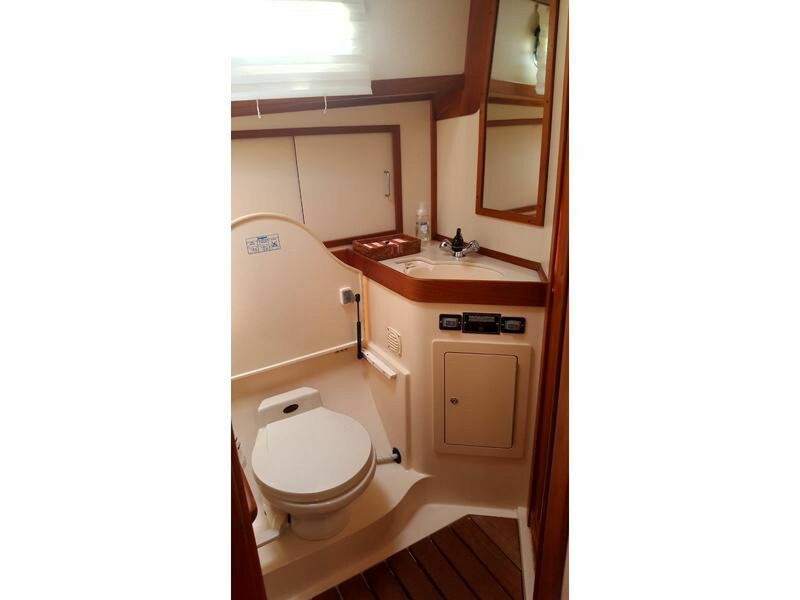 Includes hot/cold cockpit shower. 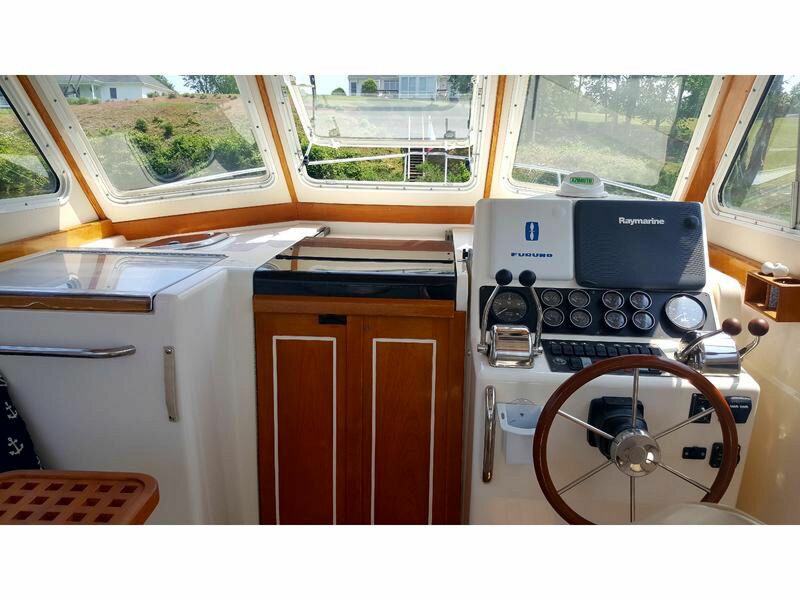 The forward deck is trim and uncluttered. Easy access is provided by stainless grab rails to facilitate safe movement. At the bow there is a CQR anchor with chain. 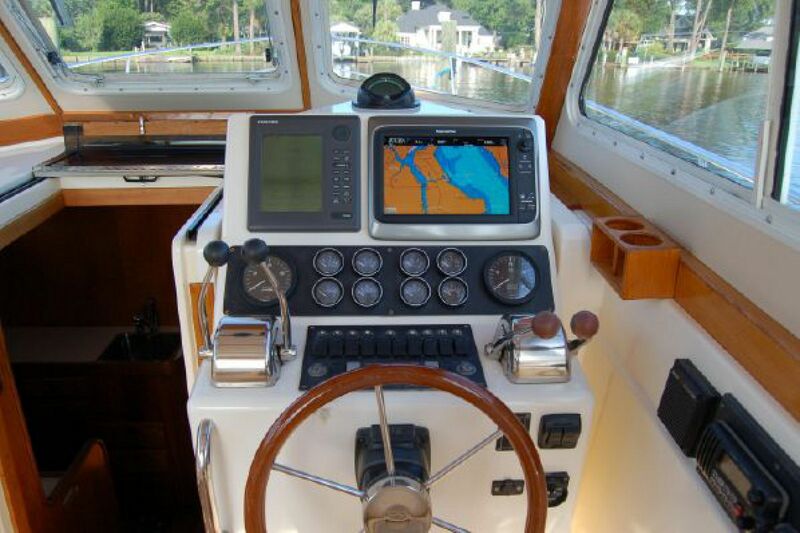 The windlass is controlled via foot pedals or from a switch at the helm. The windlass also has a capstan added to allow for line pulling as needed. 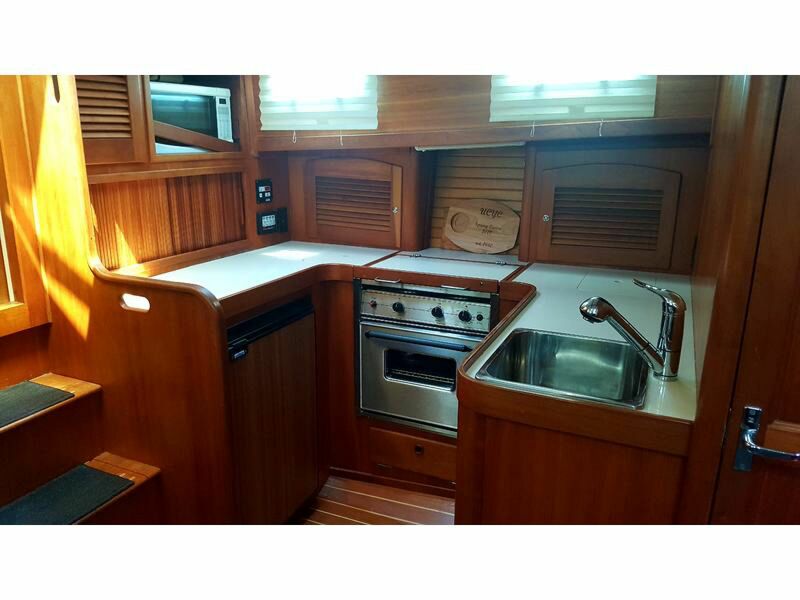 All port lights and hatches have stainless steel trim so they will last a lifetime! 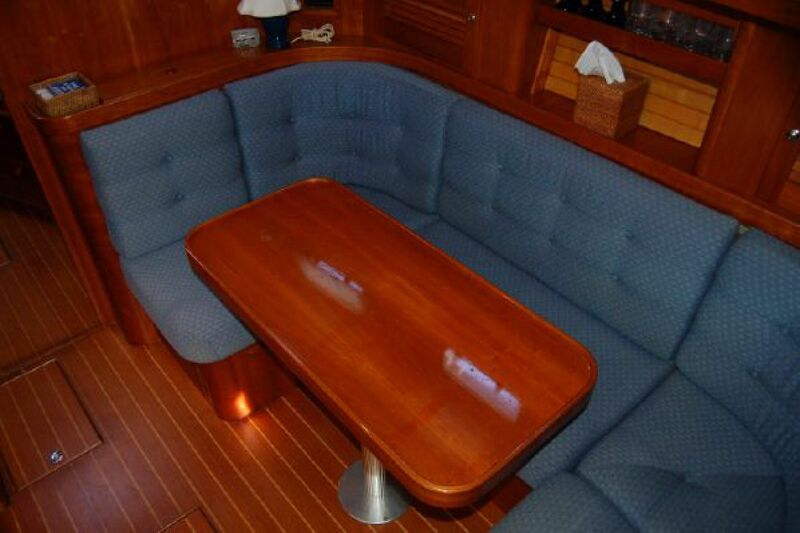 Under the cover of the hardtop is a solid teak sole with port side L-shaped settee. There is a teak table that maybe removed and stowed as needed. 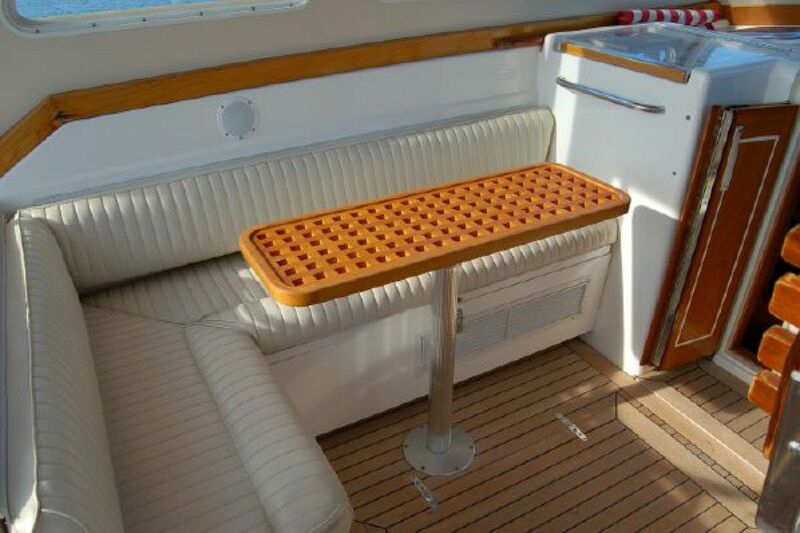 The helm seating provides 360 degree views and has a varnished teak footrest and backrest. 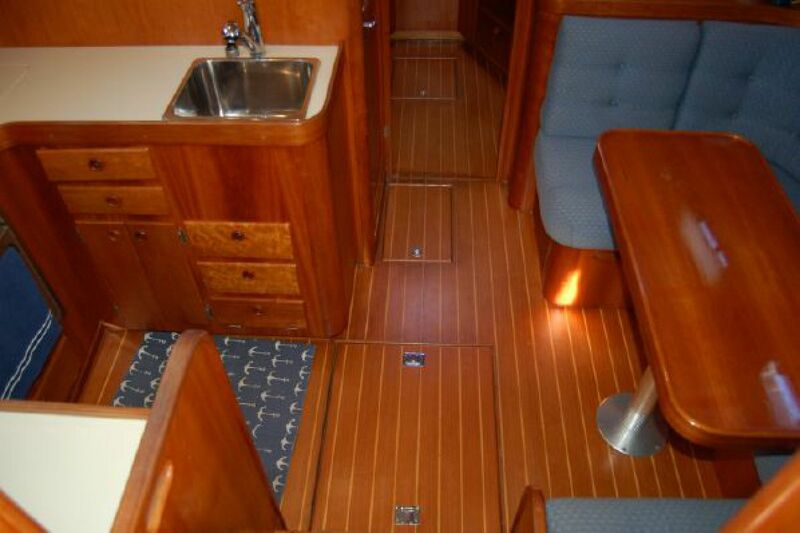 There is storage under the settee and engine room access is provided with a deck hatch. 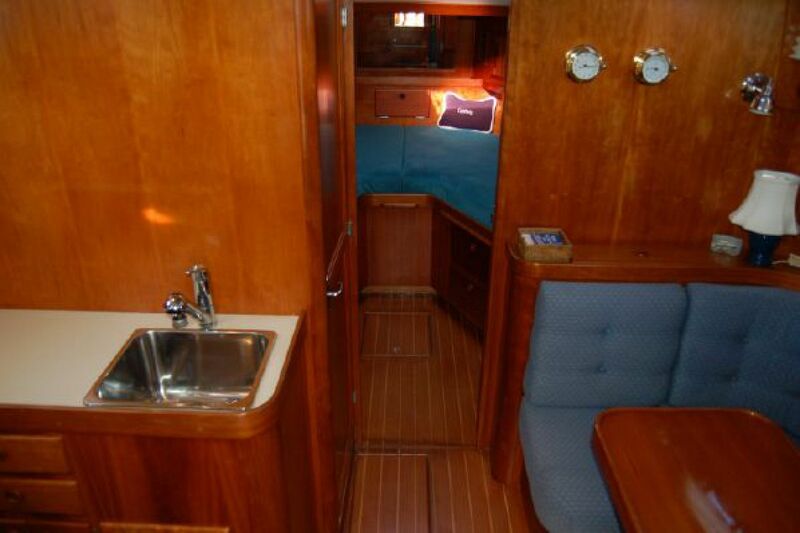 To the left of the companionway is an area for chart storage.